What would you like the Township Committee incumbents to focus on in their new term? Leave your feedback in the comments section below. We’ll pass along your feedback. There are 62 Comments to "What would you like the Township Committee incumbents to focus on in their new term?" Just keep on doing the great job you did till now!!! – Stop creating cul-de-sacs off busy streets. Put a stop to the overdevelopment and overbuilding. widening rt 9 traffic light at evergreen. paving more bad roads please!!!!!!!!!!!! I would love for them to stop the building and crowdedness on streets that cannot handle it! Also, when new stores, shopping centers or buildings get approved, please make sure there is adequate parking. It is so hard to deal with “frum” buildings, etc since there is usually not enough parking for even quiet days. A light at Williams and James. Repave a lot of roads. Require the roads to be updated before new projects are built. work for the vaad and THE PEOPLE!!!! Traffic – enough with blaming the state and the county. Get it done! Put up more lights, time them properly, add turning lanes, put do not block boxes by intersections, and STOP BUILDING!! Oh, did I mention property taxes? 1-3 – More building, more building and more building. 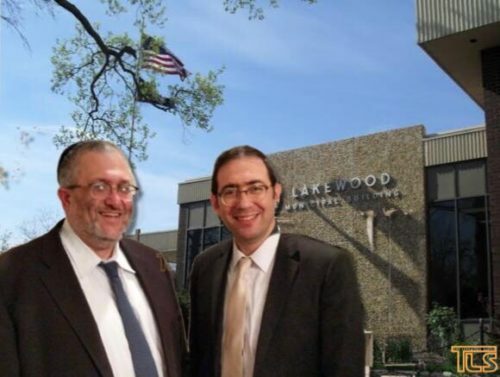 4 – The destruction of any remaining tree within the borders of Lakewood. 5 – Seeing what can be done to increase the travel time on Rt 9 from Chestnut to James from the current 15 minutes to at least 30 minutes. Oh almost forgot. PLEASE, more strip malls and shopping plazas! Would be really nice if we can build more developments on Rt 70. Preferably apartment buildings. There isn’t enough traffic in that part of Lakewood. Today I drove down the 70 and there wasn’t as much traffic as on Rt 9, so we could definitely use some more traffic there. Some very simple easy fixes. no left turn eastbound at fourth and Clifton. Amazing!! We seriously just had elections and yet we elected the same officials who by the way may be doing a great job considering the circumstances. My question is if you believe we need change vote for CHANGE!!! STOP BUILDING and put up a website showing every dollar into and out of the township. Every address what the taxes are – and every dollar out where it goes. Did anyone mention to stop building?? Oh, I see- just about everyone. What is so hard to understand, the roads are not able to maintain the overwhelming amount of new homes. please try to let the green light by the 9 and central stay green longer! this is a free solution, why not try it? our first step to solving traffic should be clearing up the main artery through town, i think all the cars that try to go around would take the 9 if was a bit faster, thus clearing all gridlock on side streets!! its free! why not try it? $17 for the Verrazano Bridge is crazy! also the price of a loaf of bread is high. And finally, please dont let the PO raise the price of stamps. Otherwise Meir and Menashe are perfect!! As if this will actually help. Build only based real traffic patterns. Take responsibility for getting the streets of Lakewood passable again. Don’t blaming the state & county for the mess were in. Don’t approve high density housing in areas like Cross st. Where the roads can’t deal with the current traffic. The greatest Chessed you can do is save our precious time from being wasted in traffic. Open up Cul-de-sacs and dead-end streets. We need to have the “through way system” where on the streets go through. It’s time to do something big for a change. Open up Cul-de-sacs and dead-end streets??? Did ya ever think the folks who PAID for those properties actually LIKE those cul de sacs??? Or do we need traffic spilling all over? Please stop the building of more developments in this township. It doesn’t make a difference how much the officials line their pockets, the rest of the township gains nothing but Tzar, headache, waste of time in traffic, etc. There should be a 100% moratorium until further infrastructure can be developed. AGREE WITH NUMBER 2. And you should with HASHEM’S help have good health to accomplish everything that you undertake to do. Amen . 1) Enforce common sense zoning laws. Mayer and Menashe, have you ever thought about the damage our stressed out driving has on the chinuch of our children? No more cul-de-sacs and only streets wide enough that cars can park on both sides of the street and cars driving on the streets can pass each other without snaking down the street. Start connecting dead end streets. I don’t know why anyone would give the township any advice on what to do. Do you really think that they care about the people that live on Lakewood. The same politicians get voted in every time and they are not held accountable for anything. PAVE PAWNEE/SEMINOLE ROADS!! THIS SHOULD HAVE BEEN DONE 10 YEARS AGO, SO ANY EXCUSE ABOUT THERE BEING TOO MANY PERMITS OPEN ON THIS ROAD IS PURE RUBBISH! The ever increasing millions of tax dollars keep flowing into this town’s coffers, but for some strange reason the quality of life in this town keeps deteriorating. Is paving roads that cannot even be walked on, not to mention driven on, asking too much?! didnt vote for incumbents .. wont till streets are paved. Traffic light on Massachusetts and prospect instead of blinker with a turn light. Getting people to stop running the school bus red lights. And enforcement of driving laws. Running stop signs hitch hiking which is illegal. People didn’t move to Lakewood for high density unregulated OVER DEVELOPMENT! Enough is enough. MAXIMUM OF ONE POLICE OFFICER WHEN ISSUING A TICKET. I’m glad everyone is giving their 2 cents. Do you really think ANYTHING will change in this town??? First hire someone with a masters in business to look at the books. Because based on the tax income this town makes annually, it’s upside down. If the answer to where the revenue is going, is major expansion, put a freeze on all new projects if you can’t handle the existing ones. The condition of dozens of roads are really bad, pot holes are everywhere. Our parks look like they haven’t been upgraded in 15 years. The public school buildings need a facelift. Bottom line is misappropriation of funds have turned are town old and dirty, while we in New Jersey have the highest prop tax in the nation! But remain in debt unlike other cities and states. It might be time to ask for some help from people who made it work. how about a digital sign by chesnut and route 9 facing north telling you your eta to 1)the hospital (mmcsu) 2) james 3)route 88 4)seventh st??? A light at Massachusetts ave. and Prospect st. I believe we need traffic calming measures like lowering the speed limt like they did in NYC, that would lead to no accidents of fatalities. in addition we need more affordable housing we should make sure that 50% are affordable even if that means giving them extra height levels.